Derbyshire’s 2017 player of the year says Test match cricket will remain the pinnacle of the sport. 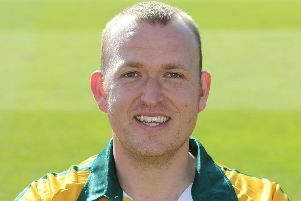 Alex Hughes defended the longer format of the game against the growing popularing of T20 cricket as the county prepared for the new season. England stars Adil Rashid and Alex Hales recently announced they would only be playing one-day, white-ball matches this summer. But all-rounder Hughes, 26, a graduate of the Cricket Derbyshire Academy, said: “I think Test cricket will be here forever. “There is too much history that goes with it. “We are constantly looking back and comparing eras all the time. Last season success in the T20 Blast, reaching the last-eight, transferred into the four-day format as Derbyshire avoided repeating their bottom place in Division Two the previous season and finished a healthy eighth. But Hughes acknowledged that T20 cricket is growing and that focus has shifted towards the high-tempo format of the sport. “There will always be a lot more money going into T20 but, in my opinion, that’s good for everyone,” he said.